Thursday October 25th 1900 Did two churnings this morning and finished putting the tomato pickle away. I put in all the afternoon doing mending Will busy about the place and Mrs Evans helped Leonard with the corn the new man went back to town tonight. Friday October 26th 1900 Will took the butter to town. I was busy with the work till noon I did a lot of baking. I cut out shirts and sewed all afternoon. Saturday October 27th 1900 I sewed a little and got the dinner be a little after eleven. Will and I went to town in the afternoon to have my teeth finished. It has been a warm week, today was like summer. I had a letter from Mother. 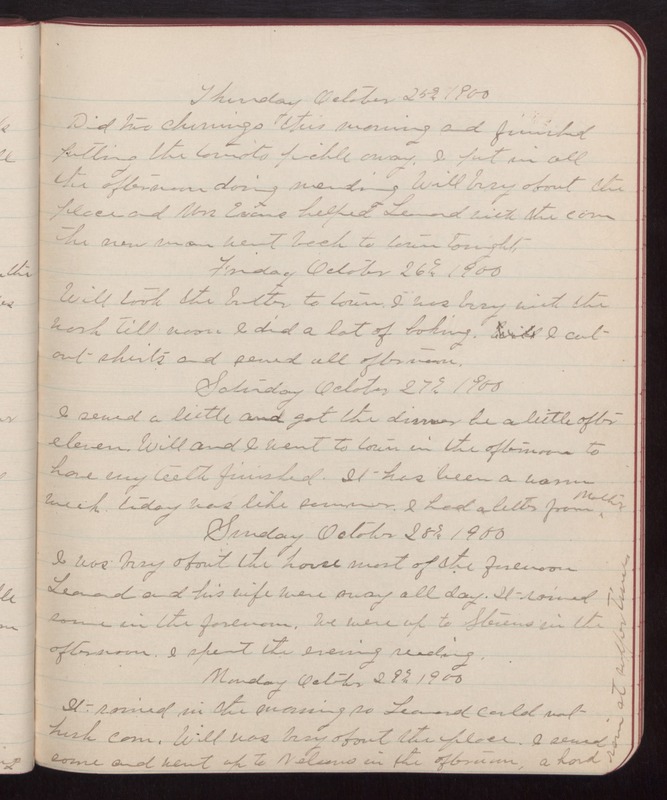 Sunday October 28th 1900 I was busy about the house most of the forenoon Leonard and his wife were away all day. It rained some in the forenoon. We were up to Stevens in the afternoon. I spent the evening reading. Monday October 29th 1900 It rained in the morning so Leonard could not husk corn. Will was busy about the place. I sewed some and went up to Nelsons in the afternoon. A hard rain at supper time.